Enjoying the view from the top of Raven Roost, Virginia. If you ever want to experience all 4 seasons, Virginia would be the place to go! All the trees are slowly changing and the weather are definitely getting cooler. When the trees changed color I normally go for a long drive along the maintain. Since my best friend is a local, she suggested that we should go to Raven's Roost. Raven's Roost is an overlook located in Blueridge Parkway, Lyndhurst, Virginia. With the elevation of 3200', this overlook offers view of the Shenandoah Valley. This is a great place for any photo opt. There are also picnic area where you can have a fun cook out and enjoy the view with your love ones. It was quite windy that day so I had to layer to keep myself warm. 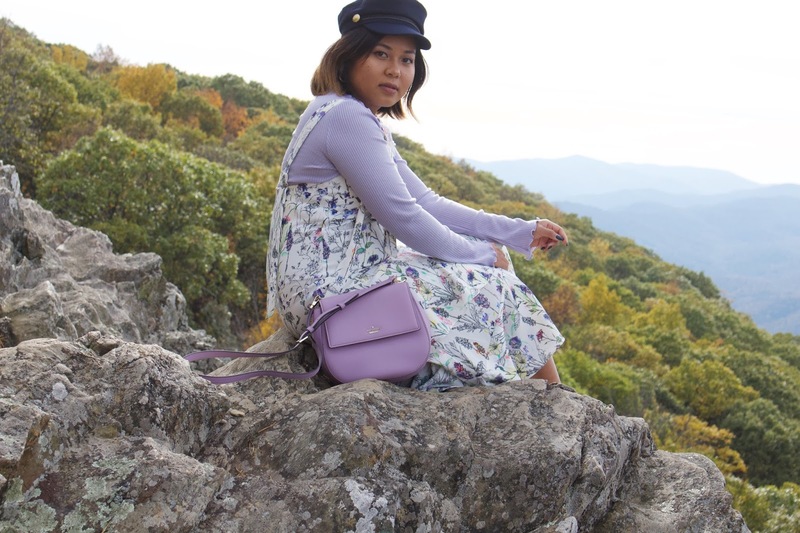 I thought this would be a great time for me to show you all how I style this summer dress from my previous post during fall. For this outfit, I just wore this light lavender sweater underneath the dress. I really enjoy wearing sweater underneath a summer dress. You can also wear chunkier sweaters and add leggings during the colder months. For shoes, I went with a simple pair of black booties that I got for a steal last year from Steve Madden. As for accessories, I choose this lilac Cameron Street Byrdie that matches my sweater and his cute military hat that I recently got. I think this hat is going to be my new favorite staple piece. P.S. don't you think Bella is really cute? she's my bestfriend's baby! I loved how you styled and transitioned this dress from Summer to Fall. And your jewelry is so pretty!